Handing over iPhone to friend or a kid? Enable Guest Mode! My kid play games on iPhone and end of the day, she would have ringed at least couple of my contacts accidently. Wouldn’t be great, if my iPhone had a guest mode where i can limit access? Of course, Android users are quite lucky in that aspect, as certain devices come with multi user support. 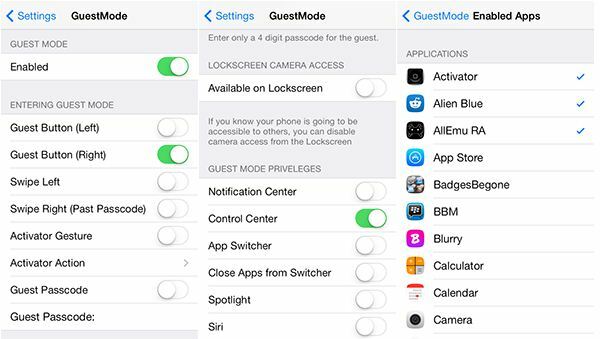 Why not tweak your iPhone to have a guest mode? A new jailbreak tweak called “GuestMode” can do that. Developed by Ian Burns, the tweak allows you to enable guest mode on jailbroken devices. It means, your kid can play games without make accidental calls or hand over iPhone to your friend without worrying about your privacy. Once the tweak is installed, you will find a dedicated menu in the Settings app with a toggle switch to activate the tweak. It also comes with a variety of options to customize. For instance, you can enable guest mode directly from Lock Screen by tapping guest button in the passcode keypad or swiping to left or right. Did I tell you that you can set an activator gesture? The app has that option as well. You can also set passcode for guest mode. GuestMode allows you to choose what apps to enable for guest mode, control access to Notification Center, Control Center, Siri, Camera, Newsstand, making a call and app switcher. Well, the app icons are not hidden completely, but they are greyed out when in guest mode. Notification Center and Control Center are made to hide in guest mode. Does the tweak completely protects your privacy? Not really! In guest mode, the user can make use of the share sheet and gain partial access to Facebook, Twitter and Mail apps. Guest mode is like Incognito? Not at all! For example, any progress or point you gained while playing a game will still apply to entire phone. Why didn’t Apple implement multi-user mode in iPhone? Well, only Apple say answer that question. But “GuestMode” tweak can be handy until Apple implements one. GuestMode will support only iOS7 devices and to download you require 99 cents. 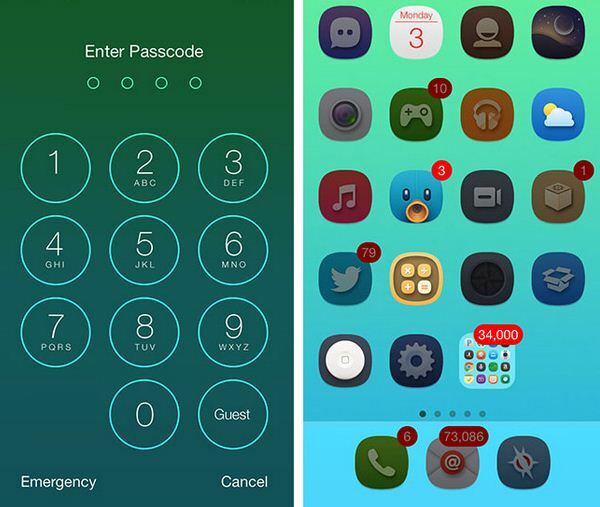 The tweak can be downloaded via Cydia (launch Cydia app and search for GuestMode). Can I protect individual apps with passcode? Well, then you may have to install iAppLock.